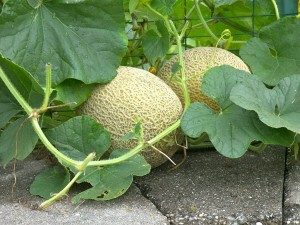 Sweet garden cantaloupes ready for the picking. Lovely Lisa, the neighborhood queen of zucchini and tomato cultivation, has diversified this season. She’s growing cantaloupes and I think she’s on to something. One plant is bearing enough sweet, juicy orbs to supply an entire block of freeloading friends. I picked two cantaloupes and let them to ripen for several days in a cardboard box filled with tomatoes, peaches, and other fruit sitting on the kitchen counter. The rind beneath the webbing actually turned a lovely yellow, something I’ve never seen with store-bought melons. I could actually detect the scent of cantaloupe! I remembered a Southeast Asian mixed melon salad recipe from Susan Feniger and Mary Sue Milliken of Border Grill fame. It’s a vivid mélange of lime juice, sugar, hot chiles, and mint. At the southern tip of the Italian peninsula lies an Italy that few people know: a land of fragrant citron and bergamot orchards, ancient olive groves and terraced vineyards; a place of persistent tradition and ritual where the annual swordfish catch and hot pepper harvest are celebrated with elaborate festivals, and where women still roll pasta dough around knitting needles. The land is Calabria, the long, skinny toe of Italy. 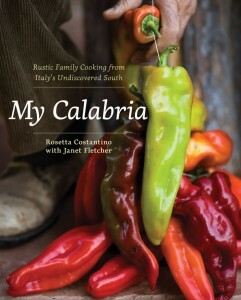 In her stunning new cookbook My Calabria, author Rosetta Costantino seduces us with the food and heritage of the region where she was born. 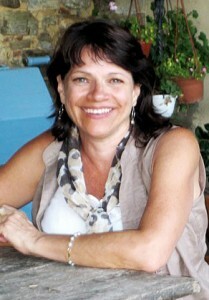 Hers is the first English-language book to document la cucina Calabrese. 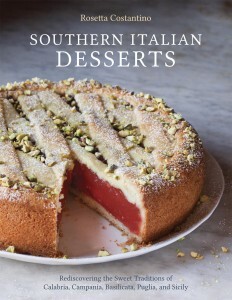 Costantino, with the assistance of co-writer Janet Fletcher and photographer Sara Remington, casts a spell on readers, enabling us to practically smell and taste these wonderful rustic foods. Calabrian cooks and Calabrian cooking are intimately linked to the land and the sea. In a region that has known its share of poverty, the legacy of foraging and agriculture is rich and diverse . . . sweet red onions from Tropea, noce pesca gialla (thin-skinned yellow nectarines), diavoletti (hot peppers), pepe rosso (elongated sweet peppers), fico dottato, (golden-fleshed fig), fico del paradise (red-fleshed fig), elegant purple melanzane, wild asparagus, tuna, swordfish, shrimp, anchovies, sardines. Dietary staples include breads, hand-made pastas, and cheeses. One rustic bread is the friselle, a dried rusk that is often rehydrated with juicy sweet tomatoes and fruity olive oil. Pastas are myriad. Dromësat, a specialty of Calabrians of Albanian descent, resembles couscous. 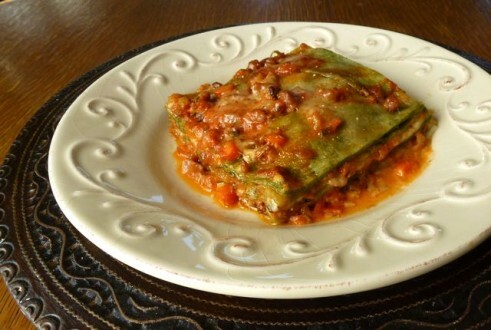 Cannaruozzoli is similar to ditali while schiaffettoni are small squares usually rolled around meat filling like a small cannelloni. The cheeses are localized and depend upon the terrain. Coastal pastures and mountain meadows nurture cows who give milk for the luscious butirro, which is like caciocavallo on the outside with butter in the center. Sheep and goats cling to the steep mountainsides to produce milk for Pecorino Crotonese and the ricotta that’s made from its whey. Unlike other parts of Italy, Calabrian pecorino is not necessarily all sheep’s milk. It can contain goat’s milk as well.